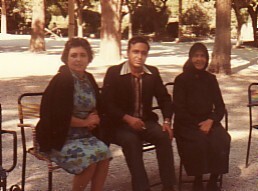 Above: With his sister, Maria, and mother, Despina, during Dimitrios' visit to Greece. 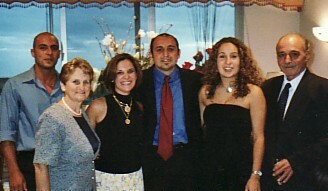 Above: With his family. From left, they are: his son, Manuel; his wife, Litsa; his daughter-in-law, Anna; his son, Andonis; his daughter, Maria; and himself.